Give the perfect gift every time with the Perfect Closing Gift. PCG is a personalization company specializing in Closing Gifts. At PCG, we’ve created a fast and easy way to guarantee your clients get something they will love. Our unforgettable products will last a lifetime. The best part, it’s personalized for your client AND YOU! Each gift was chosen to help you stand out from the crowd. Our gifts are designed to build your business by increasing referrals, strengthening retention and making your clients feel important. The Perfect Closing Gift has a wide variety of gifts. Select the gift that best suits your needs. Pick the number of products you want in your inventory. The more you buy the better your unit price. Personalize your gifts one at a time! Make every gift unique to suit your client's needs. 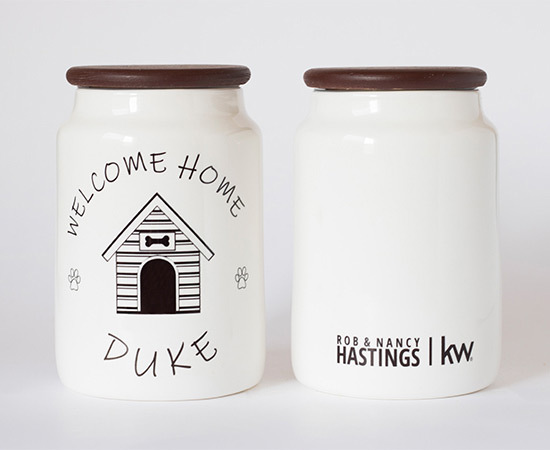 Choose the perfect engraving style to match their personality and home. 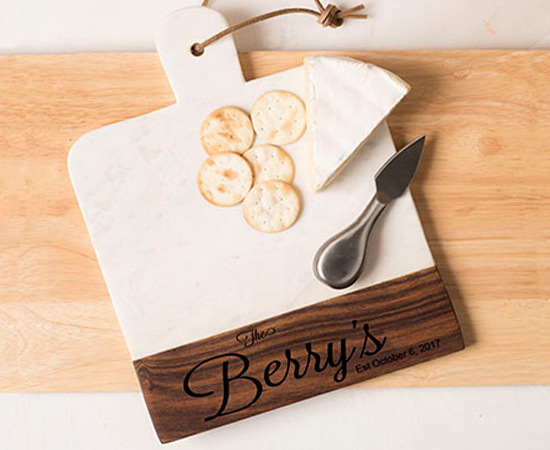 These one of a kind Italian marble and acacia wood cheese boards are sure to leave a lasting impression on your clients. Choose to give your client a luxurious cheese board or a set of 4 coasters with this amazing product. Our address stamp is a great way to keep your brand in front of your client. 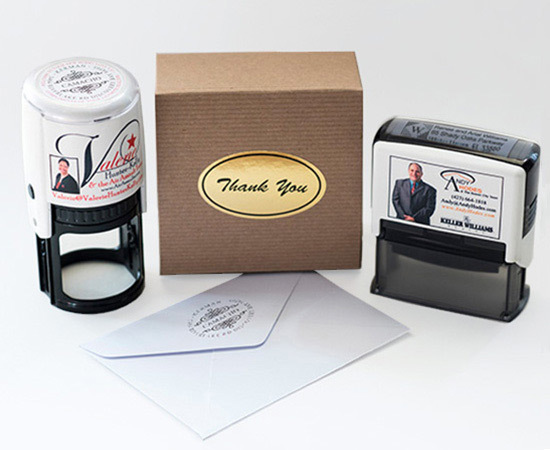 Customize the stamp casing with your marketing message and make the stamp impression your clients new home address. 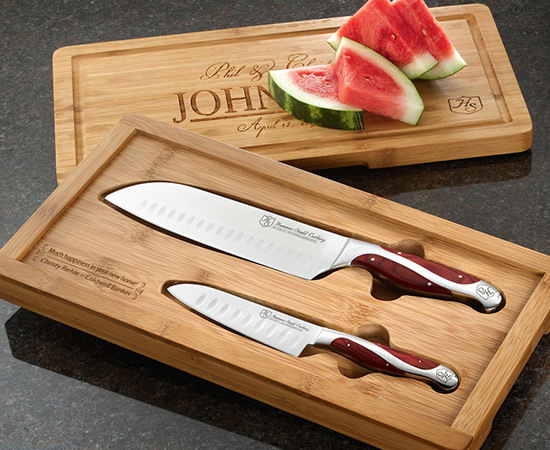 Our exclusive Tempered Glass Cutting Boards come in a large and small size. 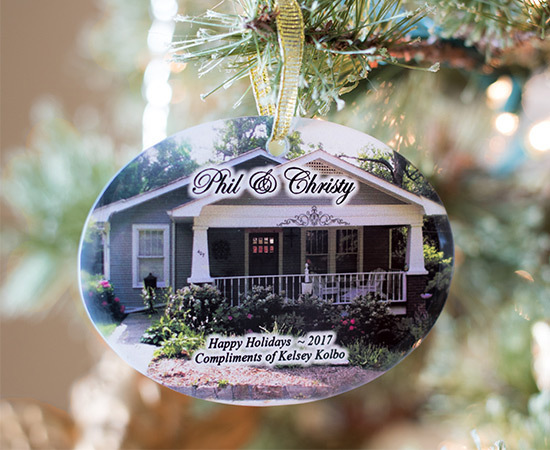 You can upload a custom photo of their home or choose from one of our 30 designs. 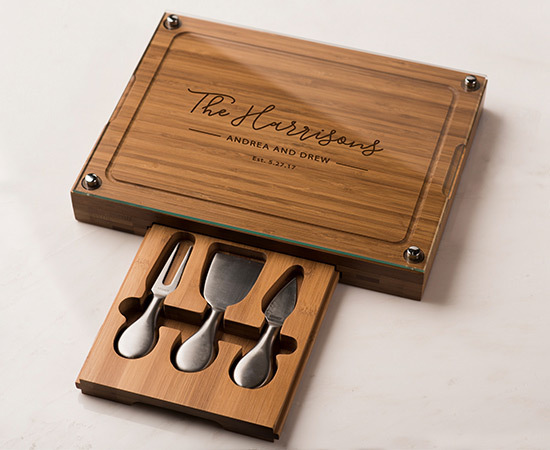 Our Three Tool Cheese Board is the luxury choice for serving cheese. Our Bamboo Cutting board is topped by a Tempered Pyrex cutting board that is conveniently removable and has a hideaway sliding drawer that stores 3 cheese tools. Luxurious Teak cutting boards are a must have for every home. Teak boards offer handsome natural grains, giving a warm, rich touch to your client’s kitchen. Select from 12 different engraving styles to match your clients personal style. PCG’s charcoal slate products offer a beautifully rustic, organic surface to match any type of household. 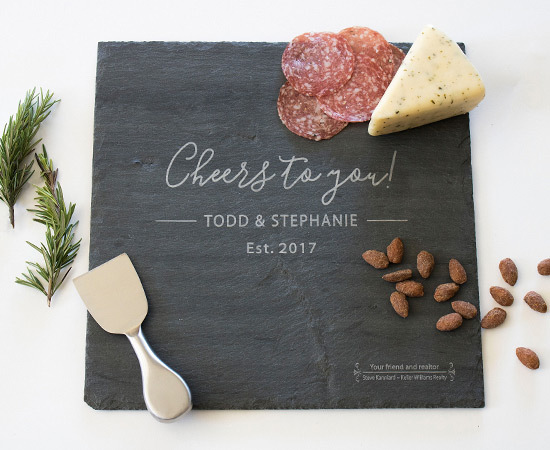 Choose to give your client a rustic slate cheese board or a set of 4 coasters. 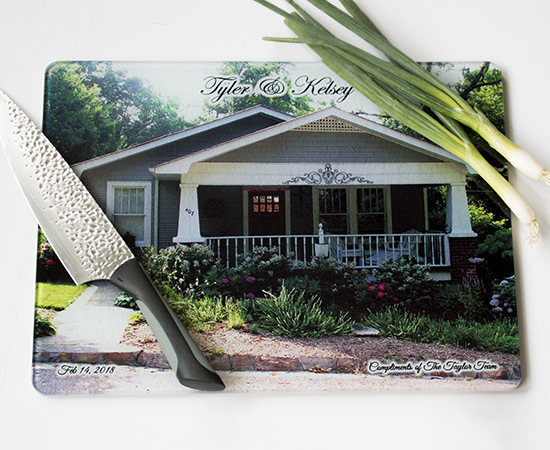 The Perfect Closing Gift’s Santoku knives are hand forged in Germany with the highest quality carbon stainless steel for exceptional durability. Each blade is laser precision measured to guarantee world class sharpness. PCG’s coir doormats are made of dense natural coconut fibers and your our client’s personalization is applied with a flocking process so its guaranteed to look great even after several years. 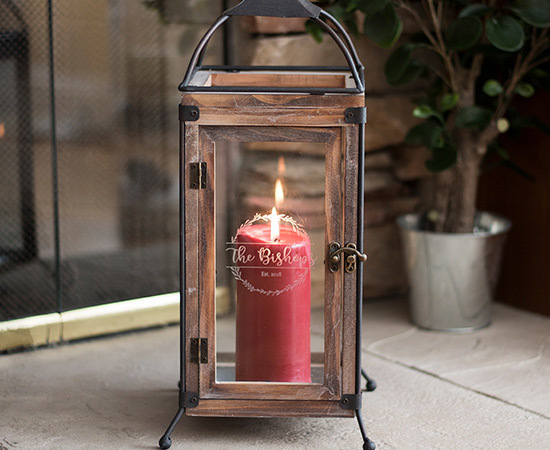 Be the focal point of your client’s living room with our captivating personalized rustic lanterns. Your client’s name is engraved on the front glass pane. Your best wishes are engraved on the back. These Charming wooden cottages are all handmade! Add your clients name to the top of each cottage. Show them how thankful you are for their business and their time with this meaningful gift. PCG’s glass ornaments are perfect for buyer or seller. Upload a custom photo of your clients home or choose from one of our stock images. 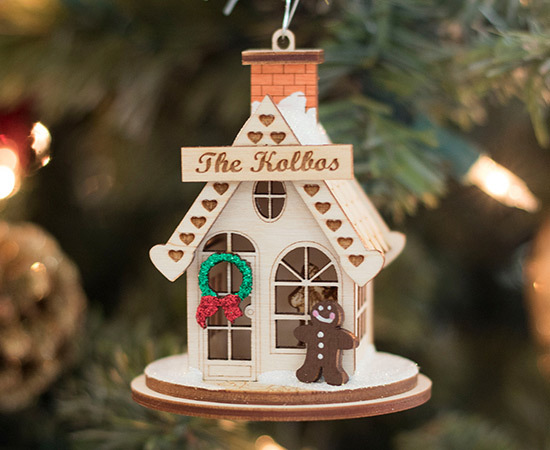 These ornaments come in 4 different shapes and 8 different designs. 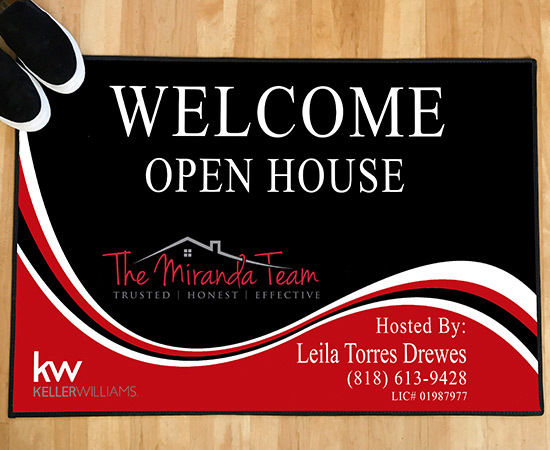 Create a warm, welcoming invitation to your Open House showings with these Custom Open House Doormats. 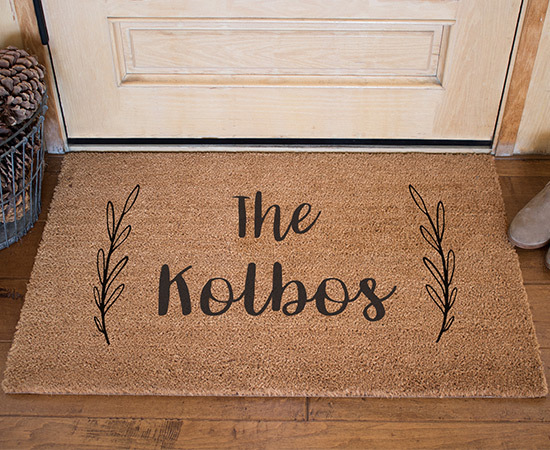 You can customize your doormat with your name, logo, contact info, & corporate colors. The Perfect Closing Gift has made its website just for realtors. We know how busy you are, so we have made our process simple, user-friendly and most importantly FAST! It takes five minutes or less to customize your gift from start to finish. Best of all, you don’t have to wait for a proof! The Perfect Closing Gift now has an online personalizer which allows you to view see your product in real time as you customize it. Step 1: Choose your product: First select the product line you would like to give to your clients. We have eight gift options for you to choose from, depending on your needs. Once you select your gift, you are ready for the next step: choosing your inventory count! Step 2: Pick your quantity: Select the number of products you want in your inventory. The more you buy the better your price! You can choose an inventory of 5, 10, 20, 30, 50 and 100 gifts. Select your quantity based on how many closing gifts you will need for a year. Your inventory shelf life is 18 months. After you place your order, we will send you a confirmation email with your user name and a temporary password. Once you receive your email you are ready to start customizing your gifts! Step 3: Redemption/Customization: Redeem your gifts one at a time with our online charter membership. We hold all of your blank inventory in our warehouse until you are ready to personalize your gift. When you have a closing, simply login to your charter membership with the user name and password given to you. Your custom online order page allows to you personalize your gift with your client's name and your custom message and signature line. Once you have finished designing your gift, choose to ship it directly to you for hand delivery, or ship it directly to your client. That’s it! Why choose the Perfect Closing Gift? 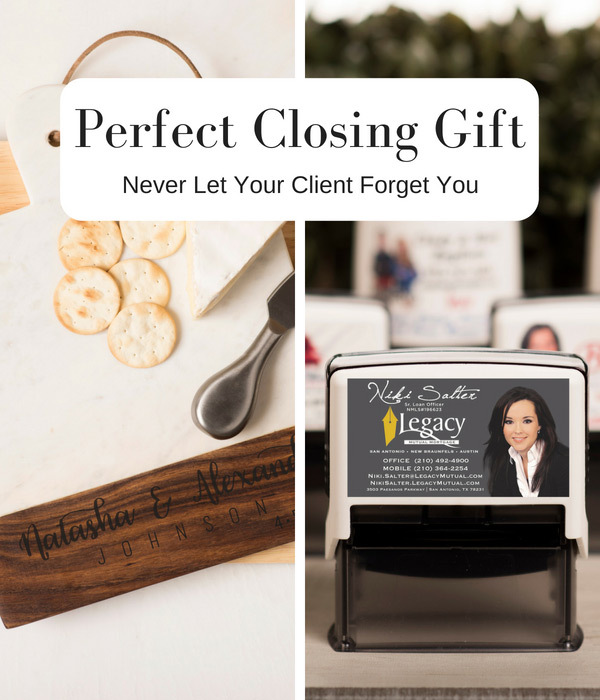 Here at the Perfect Closing Gift, we’ve been working for realtors for 17 years. Our process was created to meet you and your client’s needs. We've studied psychology, marketing, and client retention to create the perfect gifts to help build your business. It’s personal for them AND YOU! We know how important it is to make your closing gifts personal for your client. Rather than provide gifts that only advertise your services, remind your clients how much they mean to you with our personalized gifts. Providing a personal message along with your own information allows your clients to enjoy their gift and remember the help you gave them. Each product has been specifically chosen to have a practical use and shows that you’re thinking about your client’s personal needs. Each gift is something your client will use on a daily or weekly basis. This way they are always seeing your name and are reminded of your amazing service! Many realtors give gifts that are consumable, forgettable, and often rushed. With the Perfect Closing gift, you can be unforgettable with our valuable, high quality, lifelong gift. Our personalized gifts provide an unlimited shelf life as a reminder of your fantastic service and helps to enhance your future business. Rather than a quickly used gift basket or gift card, a non-consumable gift gives your client a lifetime of opportunities to think of you. All of our products are produced in 5 business days or less. Need your gift faster? We also offer rush production and rush shipping to get you your gift when you need. Our easy to use online membership allows you to check your inventory quantity, track past orders, and reorder your gifts. Because your name is on every product it is considered “marketing." This means you can write off the full price of your gift instead of the standard $25 for a closing gift. If you are not satisfied with your order each and every time, contact us so we can do our best to make it right. You’ll love it guaranteed!